Carl Theodor Dreyer was the uncompromising artist par excellence, a filmmaker whose artistic ambition and perseverance in achieving it, directly affected his output, a rather slim filmography - 14 features in 45 years. Though they had no commercial success upon their initial release, and were the subject of controversy and disagreement among critics, films such as LA PASSION DE JEANNE D'ARC (1928), VAMPYR (1932), ORDET (THE WORD), (1955) and GERTRUD (1964) have long been considered among the outstanding works of film history. This publication presents two of Dreyer's early silent classics, LOVE ONE ANOTHER (DIE GEZEICHNETEN) (1922) and THE BRIDE OF GLOMDAL (GLOMDALSBRUDEN) (1926), on one disc, available in either DVD or Blu-ray format. LOVE ONE ANOTHER (1922, Germany) takes place in Russia at the time of the 1905 revolution, as authorities decide to distract popular anger against the czarist government by fomenting pogroms against Jews. Dreyer based his film on a Danish novel from 1912 by Aage Madelung, a then-popular realist writer. The film's two very different titles both come from the novel, which was called Elsker Hverandre (Love One Another) in Denmark, but translated into German as Die Gezeichneten (The Stigmatized Ones). Though he was a lifelong foe of anti-Semitism, this film is Dreyer's sole work to deal with the theme explicitly. LOVE ONE ANOTHER was considered a lost film until 1960, when an original nitrate print bearing the Russian distribution title POGROM was found in the Russian film archive Gosfilmofond by the historian Vladimir Matusevitch. The present restored print has been made from a 2K scan of the original Russian print, now held by the Cinémathèque de Toulouse. Using Dreyer's screenplay and an intertitles list from the Swedish censorship archive, the Danish intertitles from the film's world premiere in Copenhagen have been reconstructed, adding some forty titles to those found in the Russian print and clarifying the complex narrative considerably. THE BRIDE OF GLOMDAL was shot quickly, in Norway, in the summer of 1925, just before Dreyer went to France to become famous in world film history with THE PASSION OF JOAN OF ARC. Dreyer was originally hired to adapt a play which he felt proved too ambitious, particularly given that the actors were on summer vacation from their theatre contracts; instead, he proposed an adaptation of a short novel by the Norwegian author Jacob Breda Bull. According to an interview with Dreyer*, for the first and last time in his career, he decided to be looser in his preparation for a film: "The filming had to be done from day to day, without any manuscript." Instead it was "almost improvised directly from the printed pages in [the] story." Dreyer's THE BRIDE OF GLOMDAL can be seen as a classical example of the Norwegian Village film, films that depict contemporary love stories in romanticized and sunny Norwegian villages. 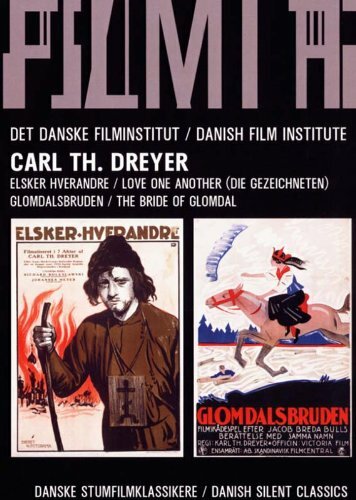 This film genre was dominant in Norwegian cinema of the 1920s, and in many ways, THE BRIDE OF GLOMDAL can be regarded as Dreyer's one foray into genre filmmaking. The film has been digitally re-mastered from the camera negative, which is held by The National Library of Norway. The publication contains a bi-lingual, Danish/English, booklet with articles about the two films written by Casper Tybjerg and Morten Egholm, each of the University of Copenhagen. Both films have been digitally restored, with optional Danish and English intertitles; and each features a new score composed by pianist Ronen Thalmay. * Carl Th. Dreyer interview: Berlingske Tidende, April 15, 1926. Screenplay: Carl Th. Dreyer, from the novel by Aage Madelung.